What will you make of the next month? The end of one month and beginning of the next is the perfect time to look ahead and reset where you are and where you’re going. It’s less intimidating and overwhelming than the beginning of a new year, and much more manageable to think about how you’ll use the next month to have more of the things you want in your career and life, and less of the things you don’t. 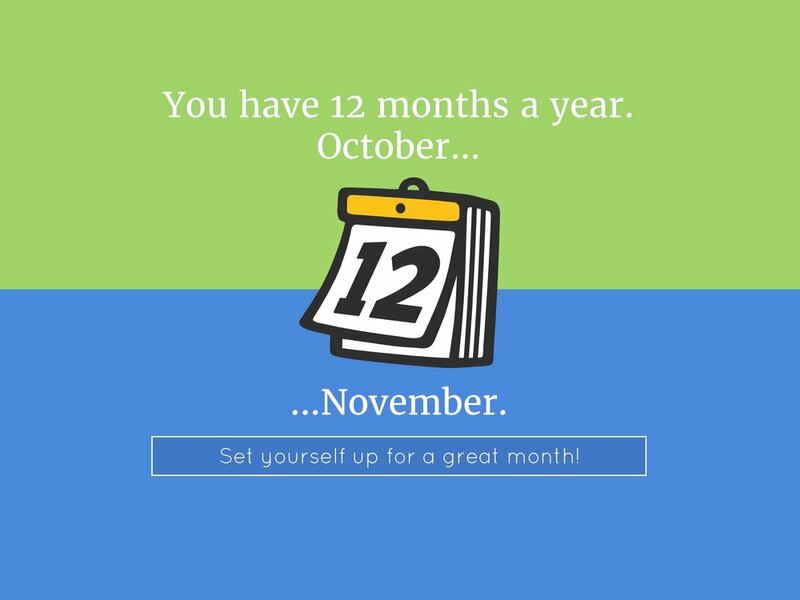 Follow these six steps to set yourself up for a great month. First, it sounds counter-intuitive, but start your look at the next month with a look back at the last. What were your wins and highlights? Did you make progress on a big project at work? Pack your lunch most days? Spend more time with friends? Whatever it is, note it in your calendar, Evernote, or somewhere else. We're good at remembering our mistakes and where we fell short, but reflecting on where you did well last month will put you in the right mindset to start the next month off right. Next, look at opportunities to improve. With last month’s successes fresh in your mind, you'll be in a better frame of mind to consider what you'd like to try new next month. Maybe your great plans to exercise 5 times a week aren't working out, so take the opportunity to decide what you can do differently -- maybe 5:30 a.m. jogs down the dark streets aren't your thing right now, but meeting a friend for a group class after work will be more realistic (and more fun). Once you've looked back, look forward. How do you want to feel looking back a month from now? What will be important to you? Maybe you want to cut your expenses, spend more time with friends, or finally make progress on that project you've been procrastinating. Within the parameters of set commitments for the month, what do you want to add to your calendar? Make sure you are include the things that are important to you, whether focused time to catch up on work, quality time with family, time to check in with your network, concentrated time to finally make real progress on that long-delayed personal project, exercise, or anything else. Equally or more important, what do you want to subtract? Consider how your current schedule for next month reflects what you want and your values. If you want to look back on the upcoming month glad that you were able to have dinner with your family four times each week, planning to attend a different networking event every night is going to make that hard. Likewise, if you want to cut back on how much you spend on entertainment, scheduling a lot of expensive outings won't support that goal. So take the time now to address it. Change yet another happy hour to coffee earlier in the day so you aren’t running out of the office or missing dinner at home, for example. You have the power to modify or say no to many of the things on your calendar, and it’s much easier to do that weeks in advance. Besides, if you’re looking at your calendar now and realizing things aren’t set up to get you the results you want, it’s not going to get better once the month gets underway and new things pop up. The next month is a blank slate, and the choice is yours: either be intentional and fill it with the things you want, or it sit back and it will be filled up for you.